Ukrainian Pianist, Juliana Yablonskaya was born in a musical family. She started her piano studies at the age of 5 at the “Lysenko” Special Music School for gifted children of the “Peter I. Tchaikovsky” Kiev State Conservatory of Music. Following her graduation from the School, Ms. Yablonskaya continued her music studies at the above Conservatory completing there her Undergraduate, Graduate and DMA studies. Ms. Yablonskaya leads very active music life, combining concert performances and teaching. She regularly appears as soloist with orchestras, gives numerous solo recitals, and performs as collaborative artist with various chamber music ensembles, vocalists and violinists in the Ukraine and abroad, including Poland, Germany, Italy, Russia, Hungary, Austria, and the USA. Ms. Yablonskaya enthusiastically and passionately promotes the music of the Ukrainian composers by including their works in her repertoire and the repertoire of her students, and also by initiating special concerts and “Meet the Composer” series, featuring works of contemporary composers. Since 2001 Ms. Yablonskaya is the official accompanist at the Kiev International Summer Music Academy where she worked in violin studios of Bohodar Kotorovich, Victor Abramian, and Mark Lakirovich, with whom she collaborates for the past ten years. 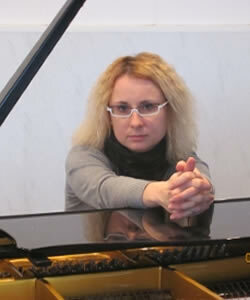 Currently Ms. Yablonskaya serves as piano faculty at the “R. Glier” Kiev National Music Institute, an historical and most revered music institutions of the country, where once the legendary pianist, Vladimir Horowitz studied. Her students are among the winners of regional, national, and international competitions. Ms. Yablonskaya is the author of the special cycle of lectures “Analyses of Performing Styles”. She is frequently travels throughout the Ukraine giving lectures and conducting master classes at various schools, colleges and conservatories.